LAHORE: (Tuesday, October 16, 2018): Punjab University Vice Chancellor Prof Niaz Ahmad has said that the country was in need of 75,000 PhD faculty members in higher education sector to meet the national requirement for the development of country. He was addressing a session jointly organized by Pakistan Institute of National Affairs and PU Department of Public Relations on academic standards at higher education level at Committee Room of Undergraduate Study Centre here on Tuesday. Senior analysts and journalists Altaf Hasan Qureshi, Najam Wali Khan, Rauf Tahir, Salman Abid, Qayyum Nizami, Dean faculty of Oriental Learning Prof DR Muhammad Saleem Mazhar, Dean Faculty of Arts and Humanities Prof Dr Muhammad Iqbal Chawla, Assistant Professor of Department of Political Science Mr Shabbir Khan and others were present on the occasion. Addressing the ceremony, Prof Niaz Ahmed said that there were only 40,000 faculty members out of which only 35 percent were PhDs. 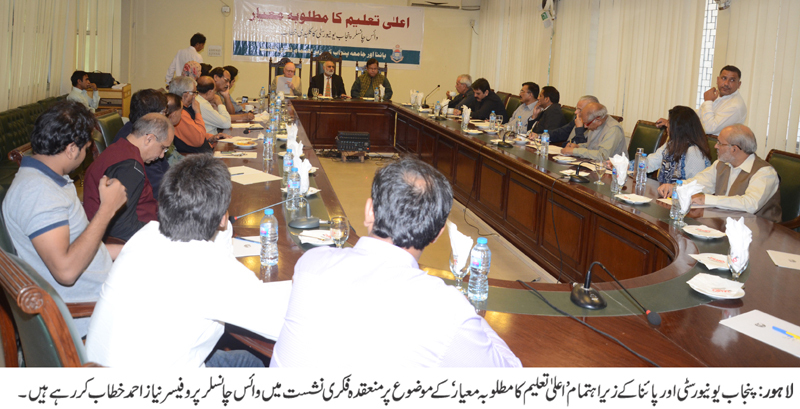 He said that the country direly needed PhD faculty members in order to compete at international level. He said that the universities were meant for creation of new knowledge. He said we need to focus on induction of competent faculty on merit, development of curriculum on modern lines and provision of best infrastructure. He said that PU administration was focusing on improving international ranking of Punjab University. He said that the university administration was focusing on good governance, restoration of PU’s academic excellence, research with socio-economic impact and depoliticizing the university. He said that the university had regulated all statutory bodies of the university within four months and Senate’s meeting was held after 13 years. He said that the administration would never compromise over appointment of competent faculty members. He said that the university had advertised key positions of registrar, treasurer, controller of examinations, chief engineer and 126 other positions in just four months which is unprecedented. The university has also made recruitment on 150 positions in just four months, he added. He said that the university would establish social entrepreneur centre to resolve social problems being faced by the society. He said that the university was also participating in QS’a Asian ranking of universities and it is hoped that we would improve our position in Asia. Later, a question answer session was organized in which various aspects regarding improvement of higher education sector were discussed in detail.